The art of fresco was never going to work in the damp climate of England. Nevertheless, the walls of pre-Reformation churches were painted, and even if this work was painted by journeymen rather than Italian masters the liveliness and vigour was certainly there. Of course, come the Reformation, none of this was approved of - it had to go. Luckily, in many cases the paintings were covered in whitewash rather than being scraped off. 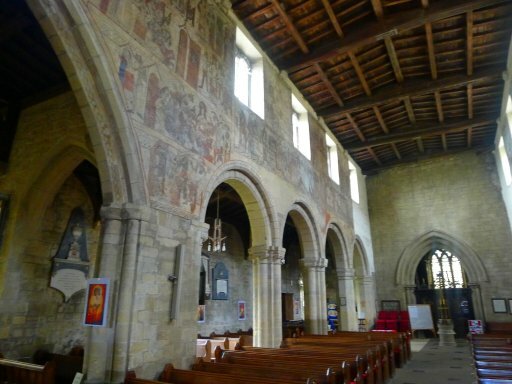 The whitewash began to be removed in Victorian times, and while the paintings are for the most part severely damaged (or heavily restored) it is still possible to imagine how these churches would have looked six hundred years ago. St Peter and St Paul, Pickering, N. Yorkshire. 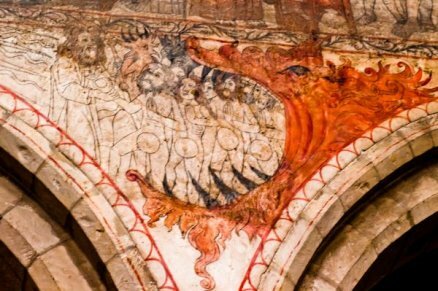 The wall paintings here are among the finest in England, and it was good to reacquaint ourselves with them in June of 2013. Along with these, Pickering has images of St. Christopher, St. Catherine of Alexandria, and a Passion sequence culminating in the Harrowing of Hell shown here. All of these themes are familiar ones, and a visitor from abroad would be perfectly familiar with them. 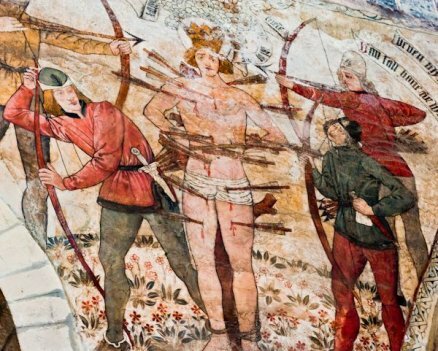 They would be pretty confident in identifying the fourth image above - St. Sebastian, or course. Only it isn't. There are far fewer churches in Britain dedicated to Sebastian compared with, say, Italy. This is a homegrown saint - St Edmund, Christian King of East Anglia, who died in 870 fighting Viking invaders. In 2012 we braved the awful summer weather for a few days in Cornwall - in fact, we managed by and large to avoid the showers, and even found a little sunshine from time to time. 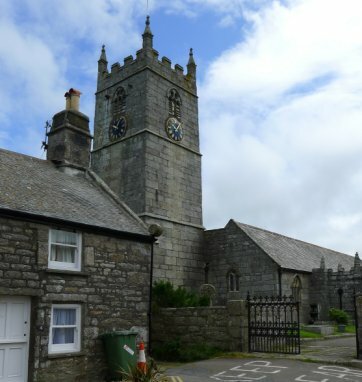 We called in at the little town of St Just-in-Penwith, and enjoyed an excellent Cornish pasty in a local cafe. 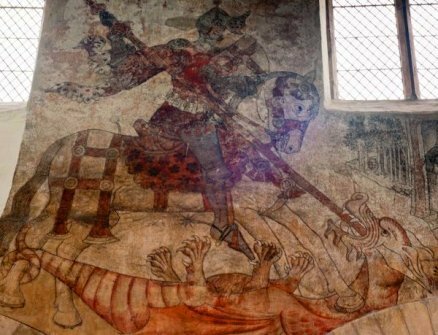 Then on to the church of St Just, where we were confronted by this extraordinary wall painting. 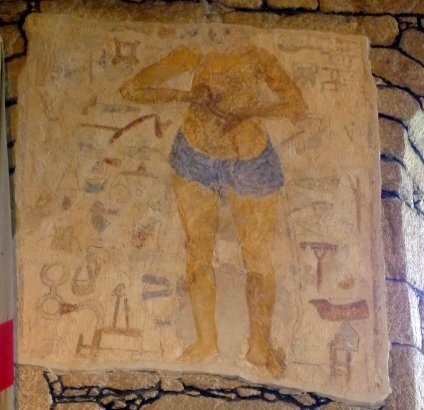 This painting was covered over, then heavily restored in Victorian times (the blue of the loin-cloth is probably not original), but there is enough there to work out what is going on. 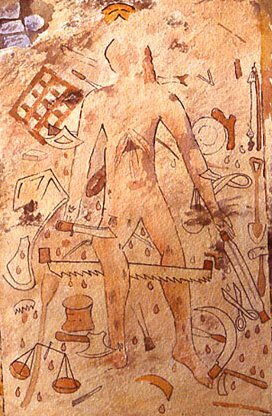 A bleeding Christ is surrounded by the tools many in the congregation would have used - many of them are familiar enough today - that rake, for instance. 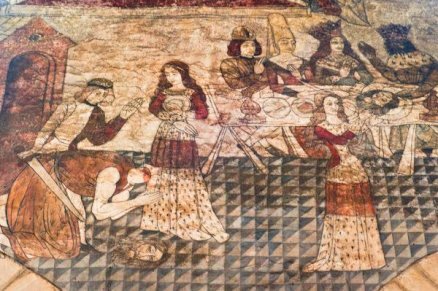 This image was once interpreted as 'Christ of the trades', a celebration of local life and a blessing to those undertaking the various trades. But this interpretation has now been discounted - it is seen now as a 'warning to Sabbath breakers', aimed at those who preferred to work rather than attending church. The tools, it is said, are turned on Christ; the Sabbath break is the cause of Christ's suffering. The thought occurs that the message would be a bit lost on those who weren't there, but never mind! There are other examples of this image in England: most frequently, but not exclusively, in Cornwall. 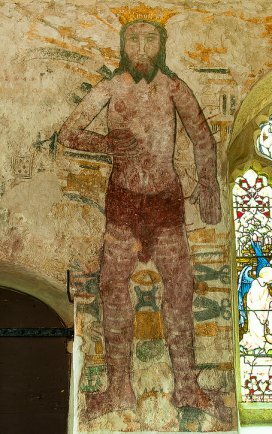 The version from St Winwaloe, Poundstock, is probably the most graphic in its portrayal of the suffering Christ. It seems that hectoring images of how to behave were an English speciality. Other themes occasionally encountered in English churches were 'a warning to swearers' and 'a warning against idle gossip'. The latter, predictably, was aimed at women. 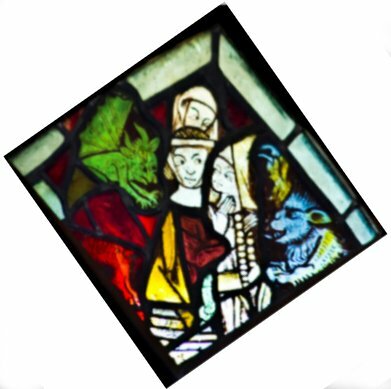 The two gossips in the stained glass window below clearly haven't noticed the devils. Are they encouraging the women to gossip, or is this a warning about what will happen to them if they don't stop?